The strong, silent type of pie that will give you advice, fix your car, give you shoulder rides, take you to sports games and teach you to ride a bike. 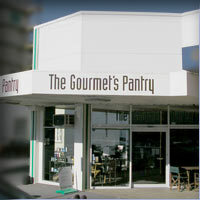 They are the wholesome, dependable pies that people love to eat, since 1981. Take a little heat from red chilli and a good whiff of garlic to give Angus beef and tasty cheese the rev up they deserve. I chose to eat my Angus Chilli Beef and Cheese pie from Dad&apos;s Pie when I didn&apos;t have to share it with anyone. One of my friends had told me that it was her favourite of all the Dad&apos;s Pie range. I admit I didn&apos;t read the packet before I bit into it but I expected it to be like a nacho with chilli beans in it. There wasn&apos;t a single bean in it. After heating the pie in the microwave I lifted the lid to find a layer of cheese covering the mince filling.This also meant that I had some cheese to the lid too. The meat was definitely a quality meat that didn&apos;t have any tough or chewy bits. I would class the chilli as being mild (I am usually a medium chilli person). I am sure both my girls would have eaten it without complaining about it being too spicy. I really enjoyed this pie. It is one of my favourites. I am tempted to have some corn chips for dipping into it next time I have one. 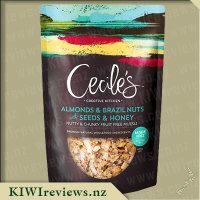 I am debating whether to tell my husband that it doesn&apos;t have any beans as he will want to try it and I won&apos;t be able to keep any in the house. It is also worth noting that I saw these in the freezer at the supermarket today and they were $2.99. This appeared to be the regular price. I have also seen them in cafes for a lot more so it really depends where you buy it. When you think of chilli beef you think nachos - well I do and with a bit of cheese that is what I was expecting when heating this pie up. I heated this pie in the oven in its wrapper for 20mins which has been the right amount of time for all the other pies. For some reason though this pie needed a little longer to heat all the way through. Looking at the texture of this filling it was quite thick and to me looked quite dry. On tasting however this was not the case and was actually a great texture. The cheese was situated to one side of the pie which was a little disappointing. On the first mouthful the taste was just that as I had expected - nachos. It really tasted as though there were kidney beans in this pie but the ingredients list says otherwise. I enjoyed the first couple of mouthfuls before the heat of the chilli really hit me. I found that after half the pie the chilli was too much for me and I abandoned the mission leaving the rest for my husband. This pie is full of flavour both chilli and beef and although I would not be able to finish a pie all by myself due to the heat I think my husband was quite happy to finish this one for me. 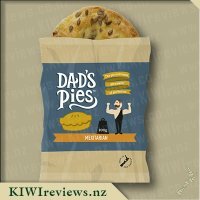 I think that Dad&apos;s pies are great value for money and have enjoyed tasting the variety of flavours on offer. I was lucky enough to be given some of these pies to review and this one I saved for a family lunch one day - I cooked up it up with four others as per the oven instructions, and cut them up for us all to taste test and offer opinions. With 6 of us tasting, we had a variety of attitudes towards chilli, but Miss 7 was the only one not keen to try this pie. As far as actual chilli flavour, I thought it was lovely - there was a bit of a kick there, and a chilli after taste, but it was perfect for my tastes. My sister, a real chilli lover, however decided there could have easily been more chilli. The others weren&apos;t chilli fans to start with, but none of them disliked the pie, they just wouldn&apos;t choose this flavour, given that there are a lot more appealing options in the range. The other comments were that the beef was beautifully tender and the filling plentiful - like all Dad&apos;s pies that I&apos;ve tasted. As I&apos;ve tasted a few of these pies now, I&apos;m quite used to the pastry and it&apos;s really grown on me. Initially I was marking the pastry as a 9, but this score has increased to a perfect 10 because in my discussions with the others I&apos;ve gone from thinking it&apos;s slightly on the dry side, to realising that it&apos;s actually a lot more pleasant than your classic cheap pie which has the potential to leave a greasy residue on the roof of your mouth. It feels a lot healthier (in fact it reminded my mother of a certain pie from a well known healthy pie chain store) and we checked the fat content and decided it was pretty good for a pie (although we didn&apos;t really have anything to compare it to at the time). With so many flavours to choose from, this isn&apos;t my top pick but it comes pretty close and it&apos;s one that I&apos;d consider trying again for sure. This is purely a personal preference issue though, so there really isn&apos;t anything that I can mark the pie down on in my scoring. Came home after a late night and couldn&apos;t find anything much in the fridge for dinner so I figured I&apos;d cook up another pie. This one stood out so while it baked away in the oven I popped down the road to the takeaways and got some chips and garlic butter to go with it. Timed it pretty well, the chips were still hot and crisp by the time the pie was almost ready, so I fried up a couple of eggs in a bit of the garlic butter as well. Putting the pie on the plate was a bit of a mission. It smelled so good I wanted to just grab it and chow down on it right away. I could smell that rich meaty smell that always gets me hungry, but I could also smell a bit of the chilli too, which added an extra layer of craving. I was strong, I managed to get the pie on the plate, the chips too, and the fried eggs on top. A squirt of sauce for the chips, the rest of the garlic butter over the top of the eggs to pool under the chips, and I didn&apos;t stop to take a photo. The pie was just amazing man, it really was. Lots of meat, heaps of flavour, some spiciness to it but not enough to put me off at all. It was the best pie I have had in ages. I used a big oven so of course the pastry was perfect. The lid was soft but flakey, just the way a pie top should be. I&apos;m really glad I went with the extras, the chips and eggs, because otherwise I think I would have headed into town to find an open BP station to buy another one of the pies. I&apos;m going to be looking out for these next time I go shopping, and to be straight up about it, I would even be ok with changing my supermarket if my usual one doesn&apos;t stock these. I am going to have more of these sitting in my freezer by the end of my next grocery trips, but I am just not sure how long they will survive. 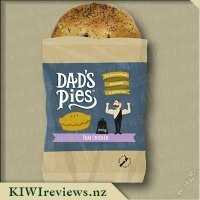 We have had some great experiences with Dad&apos;s Pies so far and each one has had its own unique qualities and flavour. It was been a very worthwhile process. I am not a huge fan of chilli but I have learned not to judge a product before I try it. I know that my husband loves anything spicy so either way one of us was bound to enjoy it. Pretty much at the same time, my husband and I suggested that there might be kidney beans in the mix. We couldn&apos;t see anything that resembled it but the taste and texture indicated that they might be in the ingredients. It turns out that we were imagining it - no sign of them listed on the packet. The runny cheese tasted really good and I like the fact that there was quite a bit there. 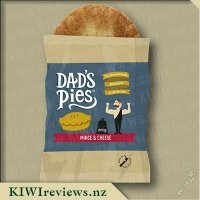 As with the other Dad&apos;s Pies product with cheese in them, they weren&apos;t stingy when they added the cheese. There was a nice combination of textures in the filling of the pie. The bits of beef were well distributed and tender. There was a hint of spice which left a lasting taste in my mouth but it certainly wasn&apos;t overwhelming. It suited my desire for a little bit of spice without it burning my tastebuds! My Dad was lucky enough to have some of the pie and as he was eating it, he was very impressed. He announced that he wouldn&apos;t mind having one for dinner. 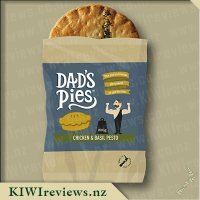 He loved this flavour but was seriously impressed with the whole range (he managed to get tastes of some of the other flavours of Dad&apos;s Pies). He said that they were so much better than your usual pies as they have too much jelly in them. He thought that the gravy in the pie was just how it should be. 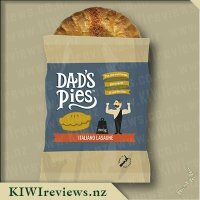 Considering the face that my dad likes to make his own food and doesn&apos;t go too much for this sort of premade option, I think this is a huge compliment to this pie and the brand. Dad&apos;s Pies have a lovely pastry on their pies and I think that it is a very high standard. 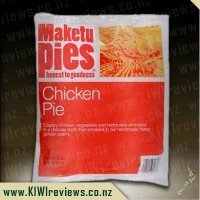 It is a huge step up from the soggy, oily pastry that one might find on other pies. I have also found that I didn&apos;t feel bloated after eating this pie. Although I am still a mince and cheese fan when it comes to pies, I really liked this pie. I think that my husband would be quite likely to choose this pie out of the range if he was given the choice. This pie was a wonderful way for me to get back to writing reviews. Because of my studies and travel for Missionary work, I don&apos;t have a lot of time to just sit and write any more, but after a few months off it was nice to have time to come back to the site and even better to be in time to grab some of the pies on offer. Angus Steak is something I have acquired a strong liking for, after some time in the States, where it is quite popular and found everywhere, it was lovely to find it here in such an easy to eat style. And there is nothing so Kiwi as a steak and cheese pie with tomato sauce on top. I found it very easy to prepare by following the instructions on the bag, and it was just so tasty when it&apos;s piping hot fresh from the oven. My only issue with it was that the pastry became very hard around the rim by the time the centre was ready to eat. I would have liked to have been able to eat that too, but it was a small price to pay for such flavoursome fillings. I will certainly be looking out for these pies in the supermarket on our next shopping trip. I understand they are getting in to the Pakn Save stores around the country at better prices. I&apos;m not the biggest fan of hot and spicy foods so was a little unsure how this pie would go down. 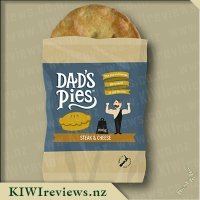 My partner though was happy enough to sample this pie for me however since it contained Angus beef which is his all time favourite cut of meat, and I was happy to just sample a mouthful or two of it to assist me with writing my review. After baking the pie in the oven for 20 minutes in its bag it came out perfectly cooked through with a lovely light and golden pastry. As I cut the pie open I could clearly see pieces of red chilli well distributed through the gravy, there seemed to be quite a lot which made me think that there was no way I would be able to withstand more than a bite full, however after a bite of the pie I was surprised to say that the pie didn&apos;t seem to have too much of a bite to it considering how much chilli there looked to be. I took another bite just to see if it had been the mouthful lacking in chilli, but still got the same result. Though the taste of chilli was there it definetely didn&apos;t have a burn your mouth taste to it. The pie contained lots of really good sized chunks of steak which were all lovely and tender, the kind of melt in your mouth meat that is often unheard of in a pie, you could certainly taste the garlic throughout the pie, which gave a nice taste to the rich, flavorsome gravy, the cheese was there but seemed to be only covering part of the pie, I would have preferred a lot more myself. Again my partner loved the taste and quality of this pie as he has done with all of the other Dad&apos;s Pies which he has sampled so far, he didn&apos;t think the chilli was to over powering and also thought the pie could have done with added cheese, as if he had wanted a cheese less pie he would have opted to try out a pie without cheese! 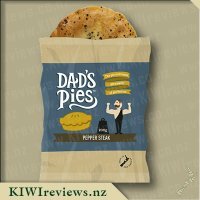 With the Dad&apos;s Pies you can tell they definitely use top quality ingredients which I love, as it&apos;s not common to find a pie with real chunks of meat and no gristle and fat intact, or a strong flavorsome gravy. Though this is not my favourite pie in the range I would certainly not mind purchasing this flavour again, especially if I knew the portion of cheese had improved, $4.00 is not a bad price for a quality pie. Angus beef is what I guess you would refer to as a premium ingredient. So when you see a pie that has the same dimensions for a similar price, you have to wonder what is lacking. One of the things that struck me when I cut open the pie, was the difference in texture. 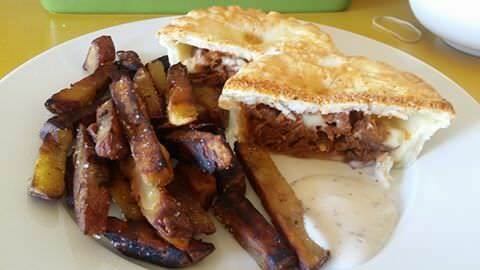 Instead of the usual meat chunks and gravy with a dollop of cheese filling the pie, I found it was comprised of "pulled beef" with little/no gravy, and scant cheese. I don&apos;t know how I feel about the pulled beef aspect of it. While it is different, and I like knowing that the meat will be more evenly distributed throughout the pie, and gives the pie a higher risk of drying out if not cooked correctly. I also do not know whether it was the fact that I oven baked it for the full 20 minutes that may have stopped the pastry from sagging, but I found the pie was a lot emptier than previous products from this supplier. Hopefully just a one-off and not a consequence of the higher quality product. I was unable to discern any "heat" from the chilli, but I do have a rather high threshold for spices, curries, and chillies, so it may be noticeable to a more european palate, but the meat definitely had more flavour to it. Very mexican taste, without the heat. In my honest opinion, I would have loved a bit more bite (read: heat) from this pie, and more gravy to provide some moisture to the product. But I still enjoyed the flavour, and the cheese that was present did mix well with the beef. A pie that I would definitely eat again, but not at the top of my wish list. The heat from the chilli was a little stronger than I would have liked but it wasn&apos;t too overpowering or take away from the flavor of the rest of the pie. A lot of pies that come with cheese are usually lacking or overloaded in the cheese department but this pie seemed to be just right for a change. The meat was nice and tender, it wasn&apos;t too tough or chewy nor did it dry out too much when cooking in the oven, it tasted good though perhaps not quite what I was expecting from an &apos;angus&apos; product. I liked this though I don&apos;t think that I will be in a rush to buy it, although I can imagine that if it&apos;s on special it would be a good pie to get for the hubby. When I decided to try this pie, I didn&apos;t know what to expect, the only thing I&apos;ve tried in the past with the name "Angus Beef" on it was a burger from McDonald&apos;s, so I had no prior expectations, which turned out to be perfect in my case. This is not to say that this was a bad pie, but it wasn&apos;t the greatest, I must admit. For one thing, I couldn&apos;t pick up on much of the cheese! The quality of the fillings was good, higher than that of most pies nowadays, the mince was quite tasty, it had a nice, rich meaty flavour, it had little gristle content, and it was rather juicy too, not dried out which always adds a bad note to something. The Chilli was a different story. I have a taste for some spicy foods, but I do have an upper limit, and I&apos;m afraid to say that the level of spice in this pie came quite close to that limit. I definitely liked this pie more than the Mexitarian one, which wasn&apos;t too bad, but compared to all the others, this one was a bit further away from the top mark. Once I imagine the taste of this pie from the perspective of someone who loves more spicy foods, then this pie becomes a lot better, although as I mentioned before, the cheese did get a little lost in the mix for some reason. "Angus Beef" - just those two words is part of a product name, ingredient list or menu item is enough to get me excited. I love it, can&apos;t get enough... maybe there&apos;s nothing more to it than good marketing and some mass psychology, or maybe it really does have some special ingredient that makes it so tasty, but if given a choice I will always lean towards the Angus option. This is one of those pies I didn&apos;t want to risk botching in the microwave - not that I seriously think I would, because none of the other pies have failed to impress in terms of how they turn out after microwave cooking - so I fired up the bench-top mini oven and cooked it via radiant heat. Leaving it in the bag was something I was comfortable, figuring that&apos;s how it would be in the little pie-warmers so why would it be an issue here? None the less, I did keep a very close eye on it and cooked it slightly longer at a lower temperature. I find that gives me a better, more evenly heated pie anyway. Decanting it on to the plate, the first thing that hit me was how &apos;solid&apos; it looked. You know how some pies look like they are designed &apos;upside down&apos; with narrow bases and big, wide tops to try and hide the fact they are tiny pies wearing sunhats? This wasn&apos;t one of those. I saw food that was built to satisfy, and it did in every way I could possibly hope for from a pie. The filling was thick and so flavour-packed, the chilli came through with no pretence of modesty, and it had a wonderful texture and mouth-feel to it that highlighted quality ingredients and a dedication to getting the recipe right. The pastry was amazing... I think I need to learn some patience and switch to cooking all my pies in the mini oven from now on. I think the paper bag is what makes all the difference, because I have seen how a pie in plastic sweats badly during cooking, especially in the microwave. 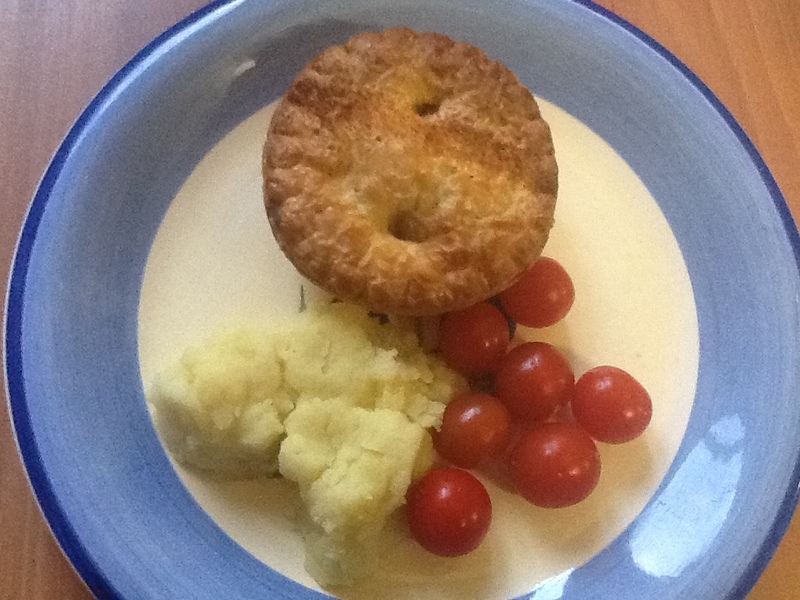 I had already been warned about how flavoursome Dad&apos;s pies are, so when preparing dinner I decided to keep things simple - one pie, a serving of mashed potato, and some fresh cherry tomatoes. And I am so glad I did. There was no need for any further seasoning or sauces - the combination of flavours was perfect and struck just the right balance between too rich and too bland. My initial reaction was one of delight as I took the first mouthful of (mainly) pastry. It was very light, crisp on the outside, and with a melt-in-your-mouth texture on the inside. I have eaten many pies in my time, and am used to encountering pastry which varies from tough to soggy. This was a masterpiece, pastry as it is meant to be but seldom is. I was tempted to stop right there and settle for the pastry on its own! However, the fragrance of the filling was too tempting - and it, too, lived up to expectations. There was a substantial amount of meat with lots of chunky pieces and the minimum of gravy (unlike some brands I could mention), and it was tender and full of flavour. The chilli component was piquant but not overpowering; it would probably register as a mild to medium in heat. The cheese flavour was quite subtle, possibly masked somewhat by the chilli. I can eat two pies if I am hungry enough, but not this time round. I was just able to finish what was on my plate. It was a very satisfying meal and two hours later I am still comfortably full. Although the packaging suggested it could be microwaved, I cooked it using a traditional oven and endured the wait. I did not want to risk serving up a less than perfect meal. Full marks to Dad&apos;s Pies for an awesome product. I will certainly be purchasing this one again. I look forward to finding them on the shelves of my local supermarket.